Store, organize, and display your cookware with the Sorbus Pot and Pan Rack. ​As a stunning addition to your kitchen, this gourmet style ceiling rack offers the storage you need to prepare a delicious meal. It features ten hanging hooks to beautifully display kitchen tools on the oval mounted ceiling rack. With a convenient grid shelf, it is specially designed to hold pots, pans, cookbooks, and more. Not only does it keep cookware within easy reach, but it saves cabinet space, protects against scratches, and creates the ambiance of a professional kitchen! It’s the perfect way to add storage and style to a restaurant kitchen, tiny apartment, small kitchen, or anywhere with limited space. A space-saving design provides easy access to kitchen tools and versatile for any room in the home. In the kitchen, spend less time digging through cabinets looking for that much needed Sauté Pan and more time entertaining guests with quick tool access. Whether it’s fancy professional cookware for holiday baking or basic utensils for everyday meal prep, display your favorite items restaurant style on a sturdy rack! In the bathroom, clear the clutter and transform your space into a spa-like retreat where towels and toiletries are neatly organized on the center grid shelf. This multi-purpose rack is also versatile enough for an office to hold books and plants or in a closet to hold baskets of accessories. The possibilities are endless! Enjoy an easy to install ceiling mounted rack to display essentials in one convenient place. Minimal assembly required with quick set-up. Package includes grid rack with 2 hanging chains, 10 pot hooks, and mounting hardware. Made of metal with powder-coated finish. Beautiful oval frame for stylish look. Complements most light fixtures, appliances, cookware, and design interiors. Measures approximately 31.50" L X 16.50" W X 21" H.
Provides added storage pots, pans, cookbooks, and more. Beautiful oval frame for stylish look. 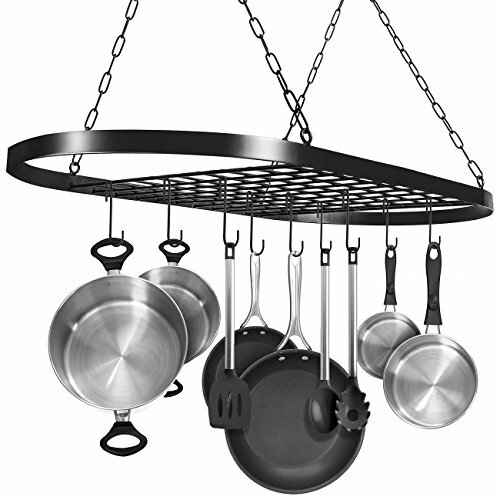 Mounts on ceiling to display cookware in one compact space. Minimal assembly required. Hooks can be arranged anywhere on the grid or rim to fit needs. Mounting hardware also included.